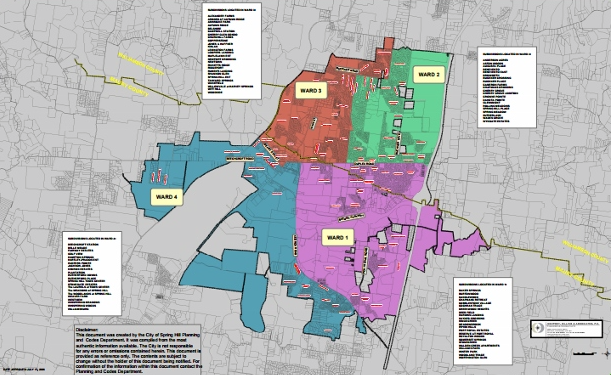 Mayor Rick Graham on Tues., April 21, announced the creation of a Spring Hill Ward Realignment Advisory Task Force to begin the lengthy realignment process to achieve population balance in each alderman ward. The task force will consist of Nanci Gregg, former Alderman Eliot Mitchell, and current Aldermen Amy Wurth, Jonathan Duda, and Chad Whittenburg.The City’s four wards are periodically adjusted to achieve population balance in each ward to ensure the concept of “one person, one vote” is represented among voters in each ward. The realignment process was last conducted in 2006. An initial brainstorming meeting was held Monday to begin discussing the realignment process, which typically is done every 10 years. The realignment will take into account the much higher population count certified by the special census conducted in 2013.